1. Download the zipped installation files from the RETS Connector website (http://retsconnector.com/). 2. Unzip the installation files. 3. From the folder where you unzipped the installation files, double-click Setup.exe. 4. Click OK at the prompt. 5. After the welcome screen opens, click Next. 6. Read the license agreement, select I agree, and click Next. 7. Select an installation folder, or accept the default; click Next. 8. Follow the on-screen instructions to complete the installation. 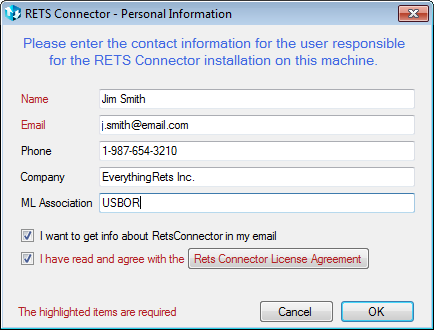 When the installation process is complete, RETS Connector places an icon on your desktop. Double-click the icon to launch RETS Connector.